Columnist Kelvin MacKenzie's contract with the Sun newspaper has been "terminated by mutual consent", the paper's publisher has said. It follows criticism over an opinion piece in which he compared Everton footballer Ross Barkley to a gorilla. News UK said Mr MacKenzie, whose column on 14 April led to a printed apology, "will not return" to the Sun. Mr Mackenzie said he would "refuse to allow" the controversy to tarnish his decades working with the newspaper. The former Sun editor added that there were "plenty of opportunities out there". 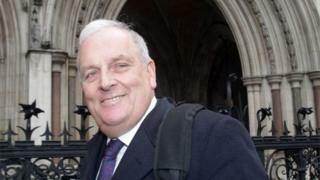 A News UK spokeswoman said: "Further to our statement on 15 April that Kelvin MacKenzie's services as a columnist for the Sun were suspended, we can confirm that Mr MacKenzie's column will not return to the Sun and his contract with News Group Newspapers has been terminated by mutual consent." The article featured a photograph of a gorilla's eyes below a close-up of Barkley, whose grandfather was born in Nigeria. In the controversy that followed, Everton banned Sun journalists from its football facilities and Liverpool Mayor Joe Anderson reported Mr MacKenzie to police for "racial slurs". Mr Barkley's lawyers also made a formal complaint about the piece. Mr MacKenzie had written: "Perhaps unfairly, I have always judged Ross Barkley as one of our dimmest footballers. "There is something about the lack of reflection in his eyes which makes me certain not only are the lights not on, there is definitely nobody at home. "I get a similar feeling when seeing a gorilla at the zoo. The physique is magnificent but it's the eyes that tell the story." Mr MacKenzie was editor of the Sun when it wrongly claimed that Liverpool fans were to blame for the Hillsborough disaster in 1989. He apologised in 2012, but the newspaper is still boycotted by some in the city. The column appeared the day before the 28th anniversary of the tragedy, in which 96 Liverpool fans died at an FA Cup semi-final in Sheffield. Last year, the Hillsborough inquests recorded that they were unlawfully killed, and Liverpool supporters had played no role in causing the disaster. On his departure, Mr MacKenzie said: "I refuse to allow this latest controversy to cast a shadow over the decades of great times I have had with The Sun. "There are plenty of opportunities out there and I agree with Winston Churchill who said: 'Success consists of going from failure to failure without loss of enthusiasm'." The Sun's publisher, News UK, is part of News Corp, run by Rupert Murdoch.